I have completely the same problem like here http://www.thefreshloaf.com/node/39900/laminated-dough-and-pastry-sheeters But there is no solution. Do you know, what is problem or how can I solve it? I have tried increase % butter of lamination and 30 minutes resting after book and letter fold and nothing. If I laminate by hand everything is ok in proofing, but if I use sheeter, the top of croissant is wrinkle and It seems like butter cracks inside and have brioche crumb after baking. The OP on that thread never gave us an update, so I don't know if my post helped or not. Have a look here. what is your desired thickness? My initial thickness of the encased butter is ¾in (about 8×8in) which I roll to 8×24×¼in. After the letter fold, I'm back to ¾in thick. My final roll-out is to ⅛in thick, from which I cut and shape the croissants. I do it almost the same only my final roll out is about 1/7 in (4mm). What is your % of butter for lamination? 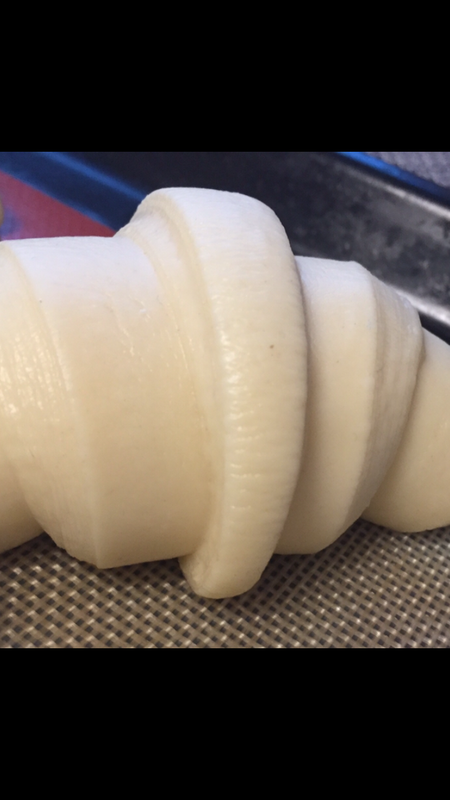 Do you strech croissants before shaping? My roll-in butter is 25-30% of the dough weight. In the summer, I tend toward the greater proportion and rest more often and longer. Yes, I stretch before/during the shaping. But, not all that much, maybe a couple of inches (5cm). Don't take my blathering as canonical. I make them too seldom to have much confidence in my own abilities. I have nice layers after lamination without butter cracks, but everything is gone during proofing. Maybe I have too thin butter layers and then crack during proofing. I use 84% french butter President. Yes, final interior is without layers, like brioche. I use 29% butter for lamination, I think it is enough, but during proofing my layers crack and croissant is wrinkle like photo. I proof around 77-78f and 75-80% RH for 3 hours. I'll try lower degree, maybe it helps. A little Late, but my take on this, When sheeting by hand with a roller you can feel the dough and its properties when going through a sheeter its faster and indiscriminate. With each pass it seems like the dough is tacky and we tend to add dusting, over the layers this dusting accumulates and essentially changes your recipe this is one thing that does have result in this effect. Another cause is too much pressure too soon compressing the dough fast tends to break the gluten quite easily and again you get the tackiness. Making sure you have adequate amount of rest and making the dough nice and cold helps you use less dusting. and your product comes out much better.